with less money. That said, it’s important for ASCs to perform the most effective processes in all facets of their practice. An Intranet automates activities that may otherwise be tedious or difficult to organize, providing a more efficient workflow for users. Here are some features of an Intranet that will benefit your ASC by saving time and energy. An Intranet enhances and organizes internal communication through a variety of ways. Breaking news and organization-wide information can be communicated directly on a newsfeed. Users have individual profiles, making instant messaging a breeze. Each department can utilize their own forum to focus their attention on their specific needs. Having these forms of communication on one platform makes for a simpler and faster process than switching constantly between applications. Workflow is streamlined and automated with a simple drag and drop form builder. Intranet administrators can easily turn any document or process into a form and build the workflow behind it creating a seamless read/sign type set up. From there, it can be sent to the proper users. The workflow is automated allowing the staff members to fill it out the forms and send them back to their respective manager or department. It’s an easier, more organized and quicker way of doing things than on paper or separate, emailed documents. This will save a great deal of productivity costs as email correspondence is cut in half and information exchange is organized and fully reportable. Intranet users have the option to add a Policy Management Solution to their system. The policy manager is completely automated, making the reviewing, revising, and approving process more efficient and effective than ever. It comes with multiple organizational and security features that will assist your ASC in remaining compliant. With all of the new mandates placed on ASCs by the differing regulatory bodies, this tool will easily accommodate many of the typical issues that can affect passed surveys and maintaining accreditation. 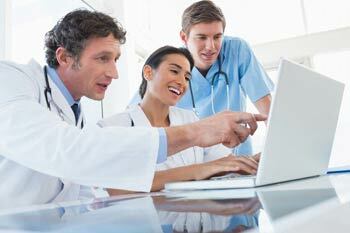 You might choose to have a separate physician portal on your Intranet. Since physicians may deal with more sensitive information than other areas of the ASC, having a portal adds an extra layer of security. It also allows them to hone in on their work when needed and creates a central hub of data without having to search the Intranet. Improving engagement for physicians can help with retention and minimize turnover. Anything can happen, and it’s essential to keep an updated plan in place for different emergency situations. Besides having the plan, it’s important that all staff members are kept up to speed on the different procedures. An Intranet can greatly assist with emergency preparedness. Keep a page dedicated to it, with plans for each situation explicitly outlined. Provide regular updates, educational videos, drills or training sessions, all communicated and organized via centralized portal. Following these best practices will ensure that your ASC is on top of its game even in a crisis, and your portal will only make it easier.